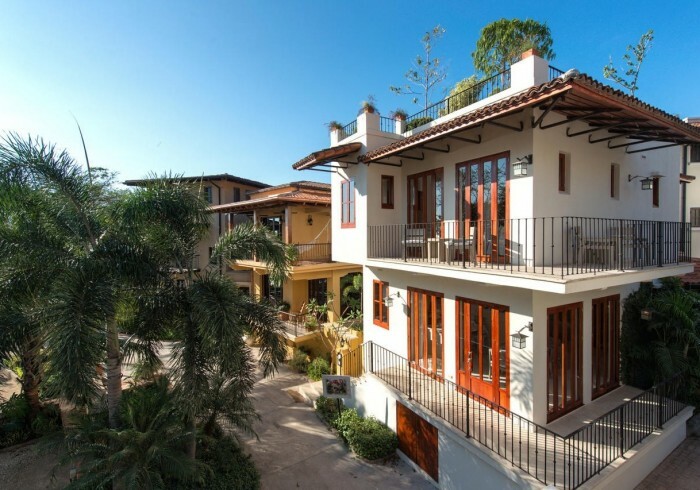 Paseo del Mar is a three-bedroom, three-bathroom ocean-view house located in the heart of Las Catalinas. As you walk through the front door you will find a wide kitchen and dining area. Open the full-length wooden framed doors to blur the lines between the interior and exterior, in the form of wraparound terraces. Further inside the house is a separate living/media room, which serves as a flex room for children or additional guests who may want to enjoy a quieter space. One guest bedroom with a queen bed is also located on the entry level, along with a full bathroom. The master suite on the second floor features a king size canopy bed, with a full bathroom, a walk-in closet, and a private wraparound terrace where you can enjoy the most peaceful ocean views. The second bedroom serves as a guest or bunk room, with sleep accommodations for up to five people. The highlight of this room’s full bathroom is its one-of-a-kind tub design. One of the defining aspects of this house is its groovy rooftop terrace with BBQ facilities.